I hold Michael Wenman over at Observations of the Fox wholly responsible for my getting sidetracked today. He’s been posting a brilliantly mind-expanding series lately about the use of geomorphs, and especially hexamorphs (like the normal square ones, but hexagons). Permutations – An overview of all the possible square geomorphs in a two or three phase system. Hexes – Shifting the tutorials to my favoured geomorph tesseract. 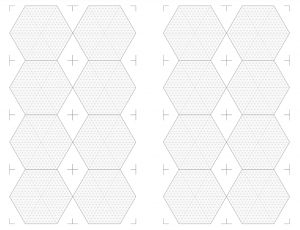 Inspired by this series I took some time today to devise some templates for printing hex tiles. I expect to use these templates mostly for preliminary sketch work, the devise a way to automate transformation of the tiles to use different content. For example, if a hex showed sections one and two as contiguous water/shoreline with water only in those two sections (minority of water), there is no real reason the tile could not be inverted to have two sections with land and the rest water. I can do similar things for plains and forest, and there I have even more options where once I have the base form I could create tiles with all reasonable combinations of terrain types. Sometimes being a programmer is incredible useful. I have two templates, both suited to letter paper. One has three columns of five hexes, each two inches from edge to edge, the other two four columns (arranged in pairs) of four hexes, each two inches from edge to edge. 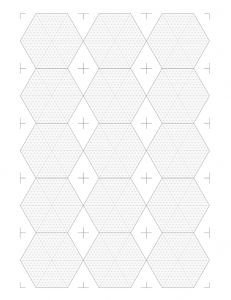 Each hex has an isometric grid (twenty rows from edge to edge) to be used as a coordinate system (the triangles are probably too small to reasonably draw in). I hope you find this interesting and useful. I’ve just printed off ten pages, I’m off to upstairs to do some drawing. Pingback: Hall of Fame: Vulpinoid Geomorph Tutorials | Keith Davies — In My Campaign - Keith's thoughts on RPG design and play.